Rocky Road - A delicious, decadent and healthy treat! This is not strictly Rocky Road in the traditional sense as it has no marshmallows or refined sugar at all for that matter. You could say it is a healthy version Rocky Road. All you really need to know is that when you sprinkle this over ice-cream, it tastes like a McFlurry! 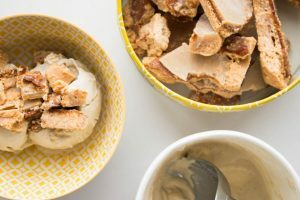 If you’re looking for some SCD-legal dairy and refined sugar-free ice-cream recipes, check out my dessert recipes. If you live in Ireland like me, you can enjoy this with Nobó ice-cream. The vanilla, lemon and passionfruit flavours are SCD-legal. My husband regularly requests a batch of this and sometimes I even have to hide some on him! Essentially, this Rocky Road is a layer of biscuit, followed by a layer of salted caramel, topped with a layer of white chocolate. This is a pretty decadent snack and definitely one for a Friday night (healthy) binge session. Most Friday nights, you’ll find me on the sofa next to my hubby watching a move with a bowl of ice-cream and this Rocky Road sprinkled over. No wonder I love the weekends so much! If you like this recipe, you’ll love my Salted Caramel Nut Bark and my Salted Caramel and White Chocolate Cups. 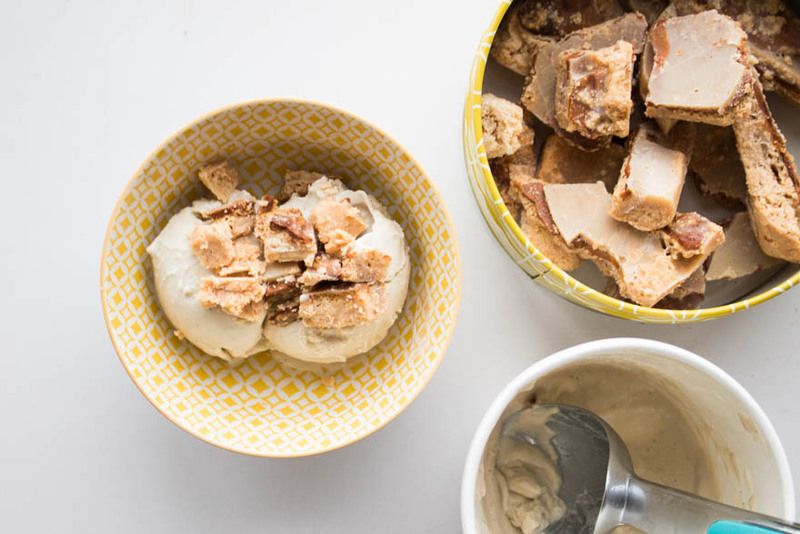 A delicious and crunchy snack to enjoy on its own or over your favourite ice-cream. Gluten, grain and refined sugar-free. Preheat the oven to: 160°C Fan, 180°C electric, 350°F or gas mark 4. Mix all the ingredients for the crust together in a blender. 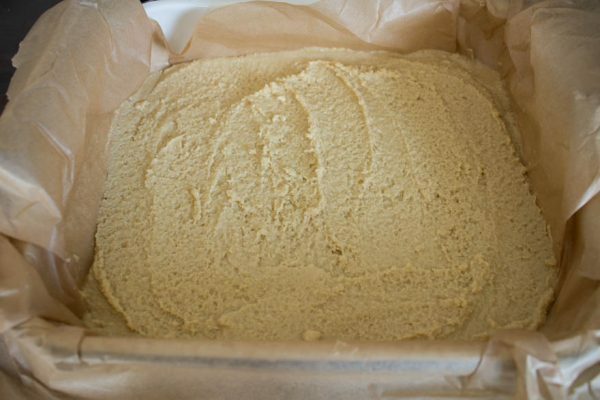 Grease an ovenproof dish well with coconut oil and press down a sheet of parchment paper on it. Press the crust down into the tin well and smooth out with a spoon and fork. Bake for 15 minutes. 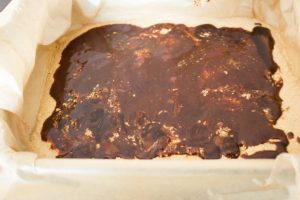 Remove the parchment paper with the crust from the roasting dish and freeze for a few minutes to cool down until the caramel is ready. You can place in a new dish or a plate in the freezer. 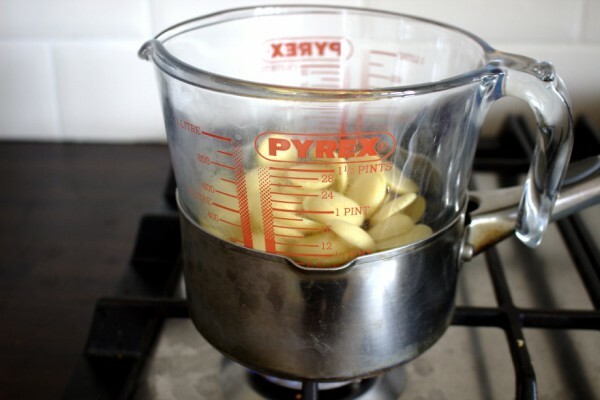 Make the caramel by melted the butter in a saucepan on a medium heat. Add the honey and salt and bring to the boil. Reduce the heat and continue to cook for at 10 minutes until the caramel turns a deep brown colour. You need to stir the mixture continuously. 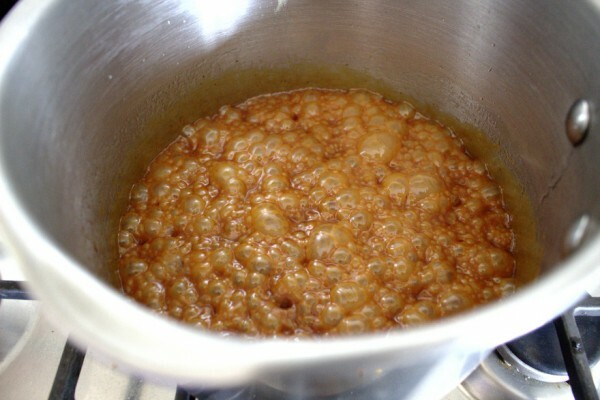 Remove the caramel from the heat and continue to stir until it resembles a sauce. Take the crust from the freezer. Place back into the original dish if you need you. Basically you need to pour the caramel sauce on top of the crust in a layer but you don't want it to fall down the sides. Pull up all sides of the parchment paper to avoid this. Freeze again while you make the white chocolate layer. Melt the cacao butter and coconut oil together in a heat proof jug over a saucepan of hot water. Once they are melted remove from the heat and add the honey, vanilla, salt and almond butter. Mix with an electric mixer until well combined. Remove the dish from the freezer and pour the white chocolate layer on top. Freeze again for at least two hours. Cut up in to chunks and enjoy on its own or as a delicious ice-cream topping. Keep in the freezer. In the ingredient list for the white cholate layer, you list almond butter and no unsalted butter. In the directions, the picture shows (apparently) unsalted butter and cacao butter being melted in a double boiler. In addition, you never mention the almond butter again. Is there a typo here? How should this read? Is it cacao butter, unsalted butter, or both, and when do I add the almond butter if not instead of unsalted butter? Hi Deborah. That was a typo. Thanks for pointing it out. You melt the cacao butter together with the coconut oil. Then once melted, add in the other ingredients. Hope this makes more sense now. I have amended the recipe accordingly. Thank you! That’s very clear now. I am looking forward to this great sounding treat!